Emily J offers a unique DJ set featuring acoustic and electronic wind instruments, special effects, glitter, accomplished musicianship and intriguing surprises. 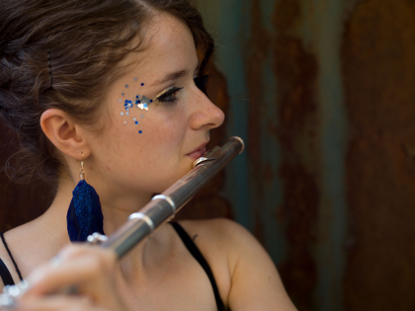 She fell in love with music through a classical education in flute playing, achieving a distinction in her Trinity College London ATCL diploma. In 2009 she discovered her passion for electronic music and built up an impressive track record of collaborations with DJs and producers all over Europe. Now an independent live act, she performs internationally using Ableton Live, her flute, the MIDI wind controller EWI4000S, softsynths and hardware. Appearances include playing with the Exploration Music DJs at Parisian venues such as Glaz'art and Batofar, shows at Shambala festival (England), and her residency at the 'Elektrisch' nights in Berlin. UK-born Emily J is a professional, experienced performer with infectious energy and positivity, adding a special twist to club nights, open air parties and festivals.